You know those surveys that companies send you by email, asking you to "take a few minutes and share your feedback with us"? This past summer I completed one such survey after attending an event at the Luminato Festival in Toronto, and after reading the obligatory message at the end which stated that everyone who completes the survey will have their name entered into a draw for the chance to win a prize, I thought, "yeah, we know what the odds of that are...."
Turns out they were better than I expected, as I received notification that I had won a prize!! 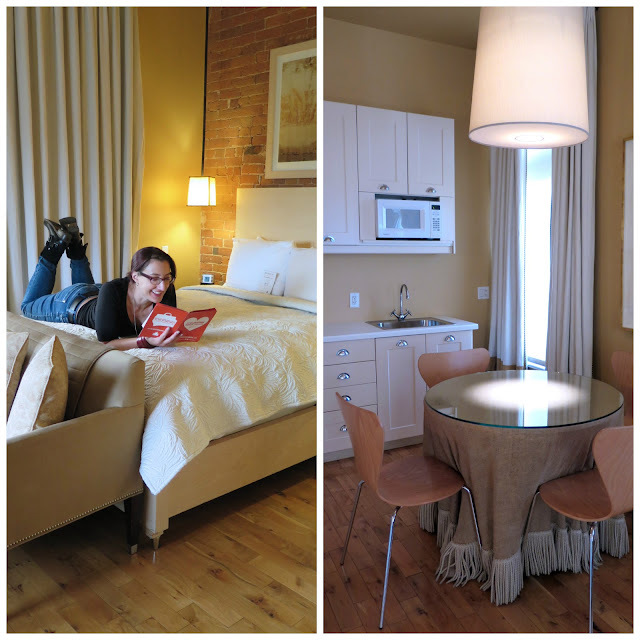 I won a free night's stay, and breakfast for two, at The Gladstone Hotel in Toronto. 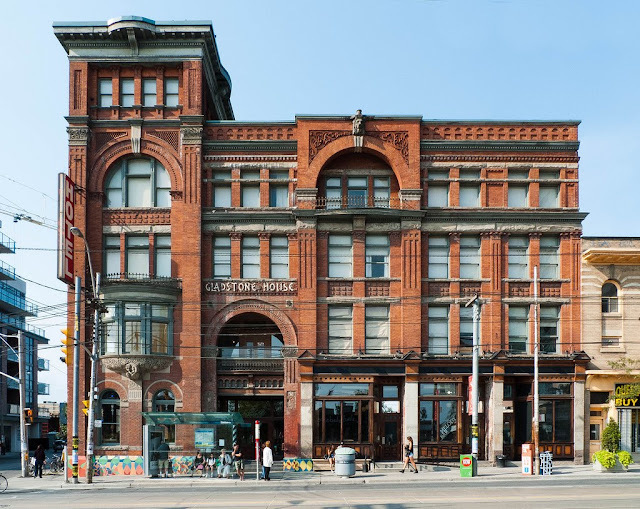 The Gladstone, located at the junction of Queen Street West and Parkdale, and at 126 years old, is the oldest continually-operating hotel in Toronto. 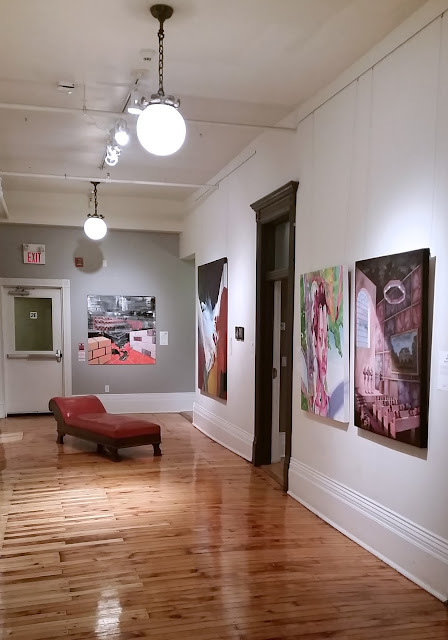 In its current incarnation, the hotel has two floors of artist-designed guest rooms and three dedicated gallery spaces, I was very excited to have the opportunity to stay there. My bestie and I had not had a chance to celebrate our birthdays (hers was in October and mine was last week) so a mini-vacation in Toronto seemed like the perfect birthday treat. 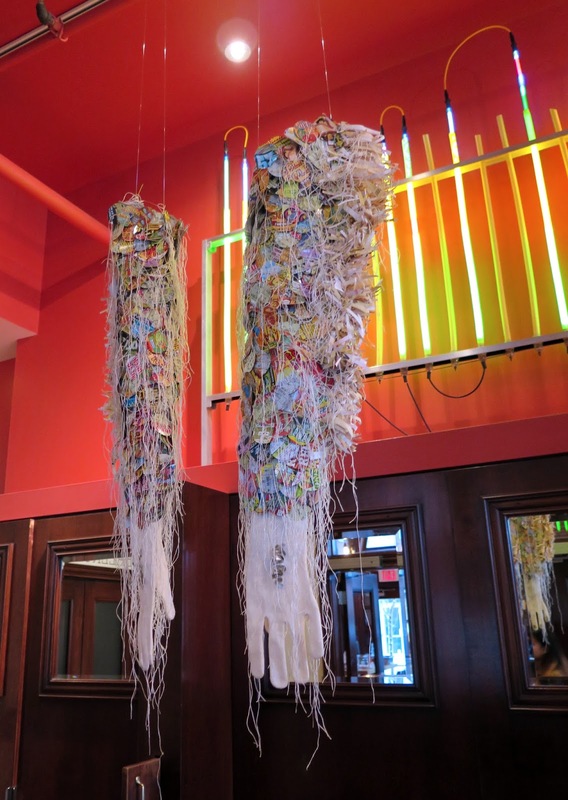 The hotel lobby is chock full of art, like the sculptural tangle of chairs Heather is sitting on (right). I wanted a photo of me on the stairs - I loved all the old woodwork in the building. I neglected to ask who created these hanging gloves over the front desk - another example of how the hotel incorporates art into every space. 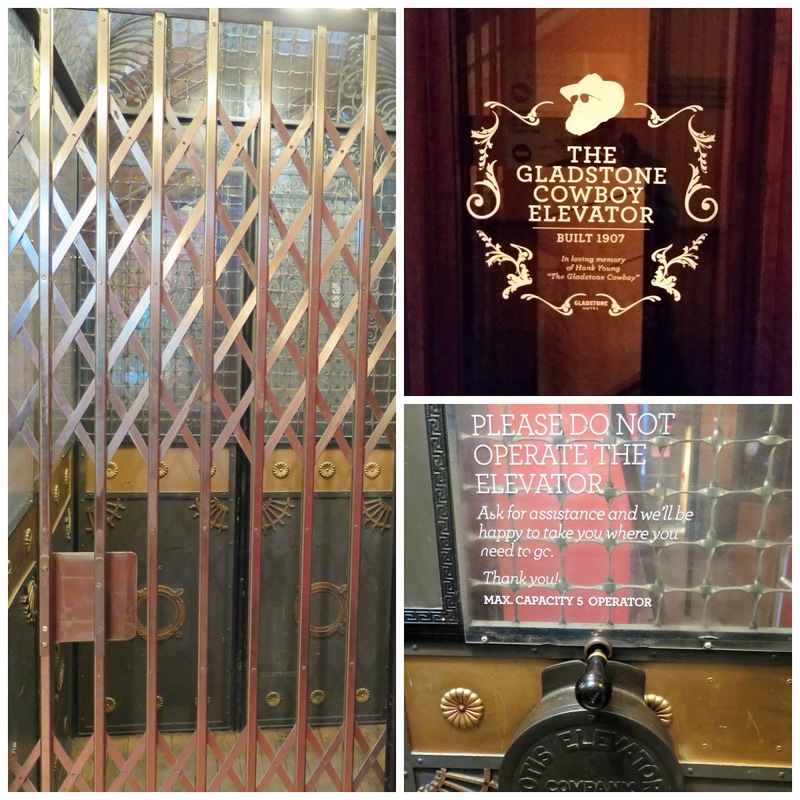 There is only one elevator, built in 1907, and guests are not permitted to operate it themselves. Fortunately, the hotel is only 4 floors, so unless you have lots of luggage, it's an easy walk. There are photos of Hank Young, "The Gladstone Cowboy" on the landing of every floor, and I thought I had taken a picture of one of them, but apparently not. Our room was the corner suite overlooking Queen Street West, and if it weren't for the lack of closet space, I could have happily lived there. The elegant decor was by Toronto designer Kate Zeidler. Outside our room was one of the hotel's public art galleries, complete with fainting couch! The weather was perfect for a stroll so, after unpacking, we decided to explore the neighbourhood. The Gladstone sits at the junction of Queen Street West and Parkdale, a diverse neighbourhood that includes West African, Tibetan and East Indian restaurants, cool vintage stores, and necessities that make the area feel very livable (like a movie rental store). 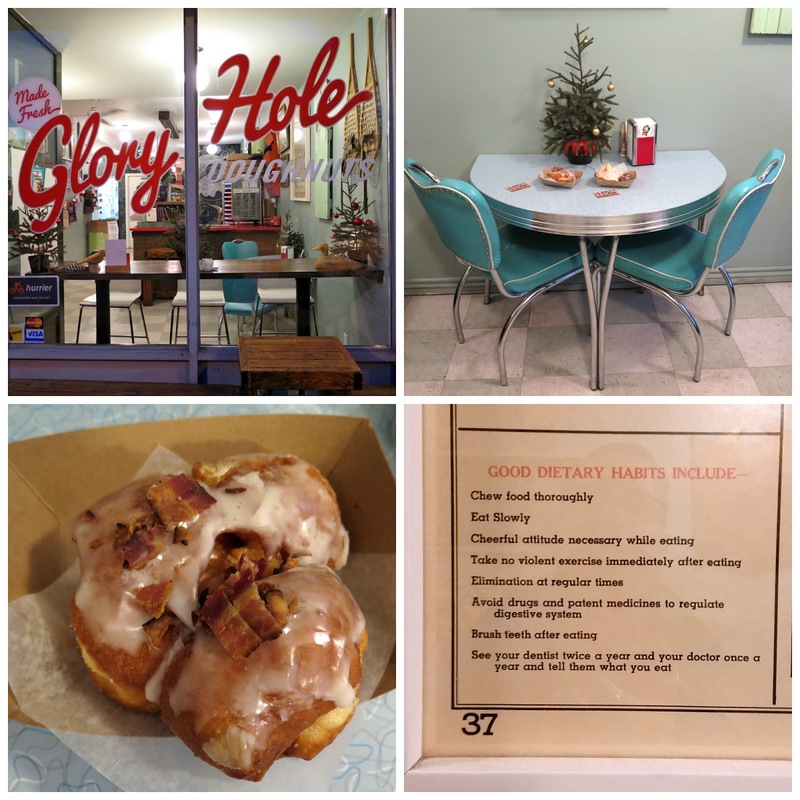 Parkdale is also home to Glory Hole Doughnuts, which has been on my list of places to visit since it opened in 2012. Their hand-made doughnuts have such exotic toppings/and or fillings as coconut cream pie filling, sweet potato cream, cinnamon, lemon basil glaze, sweet bread crumbs, or peanut butter cream cheese frosting. The selection varies depending on the time of day and by the time we got there, there was a limited choice. I had the apple, jalapeno and bacon fritter (very light and tasty), and Heather had a sweet potato cream and a lemon ricotta donut hole - both of which she thoroughly enjoyed. The doughnuts are expensive (around $3 each) which is why they are a treat, and not a staple. I'm not even a fan of doughnuts, but I would go back and get another. We also stopped in at Public Butter, another Parkdale treasure, which carries a large selection of vintage clothing, furniture and accessories alongside their own screen-printed t-shirts. There was a 50% off sale going on (which happens frequently) and I scooped up two jackets and a vest for $10 apiece. Score! After a delicious dinner at Odd Seoul, a Korean fusion restaurant on Ossington Street, we went back to the Gladstone and entertained the idea of checking out an Art Party hosted by the hotel, and ended up watching a Katherine Hepburn/Spencer Tracey marathon on TCM instead. Apparently we are not the party girls we thought we were. 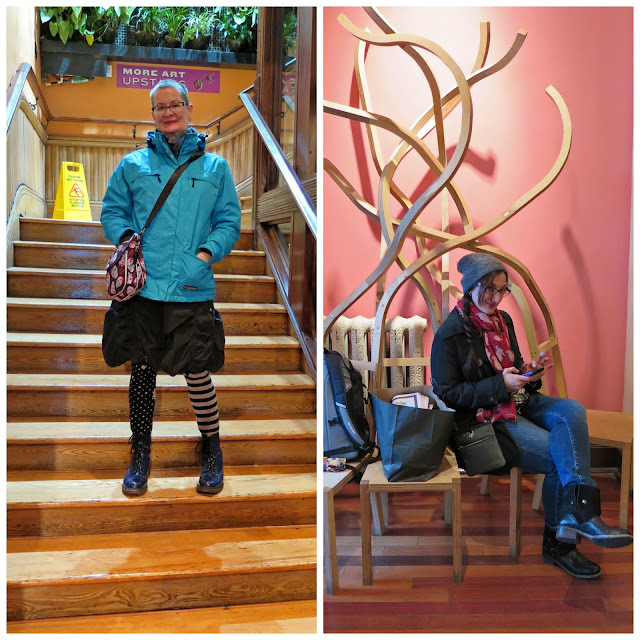 The next day we headed to Bloor Street West and passed by Holt Renfrew. 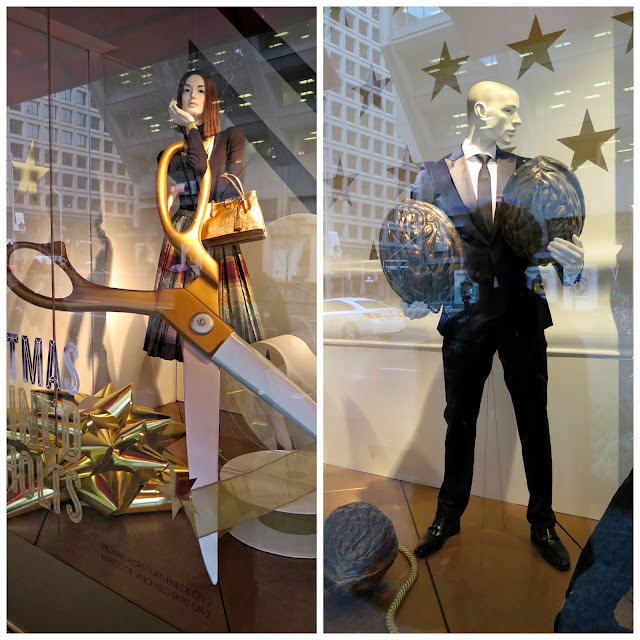 I've never been particularly impressed by the clothing in their Christmas windows, but the props are usually cool, like the giant scissors and bow in the photo on the left. The poor mannequin on the right appears to have been left holding his nuts. 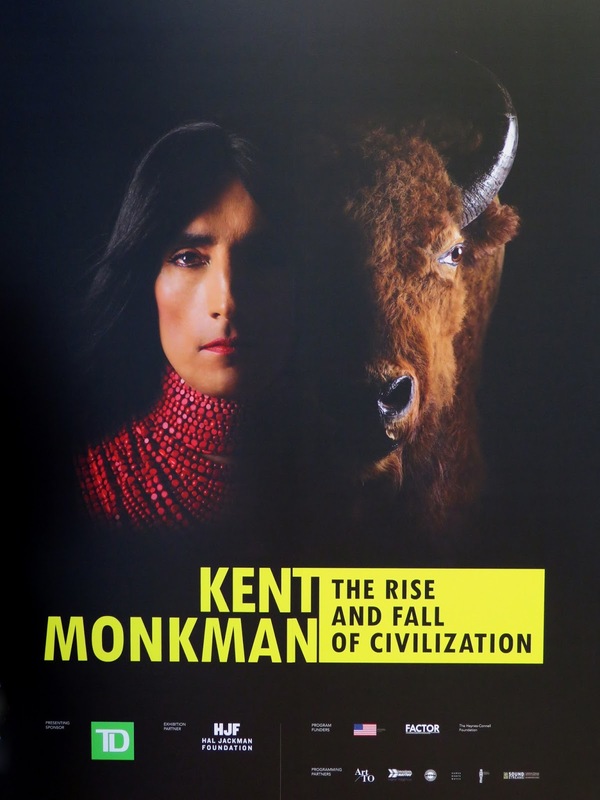 I had been told by a friend about an installation by Canadian Artist Kent Monkman at the Gardiner Museum and added it to my list of things to see on this trip. 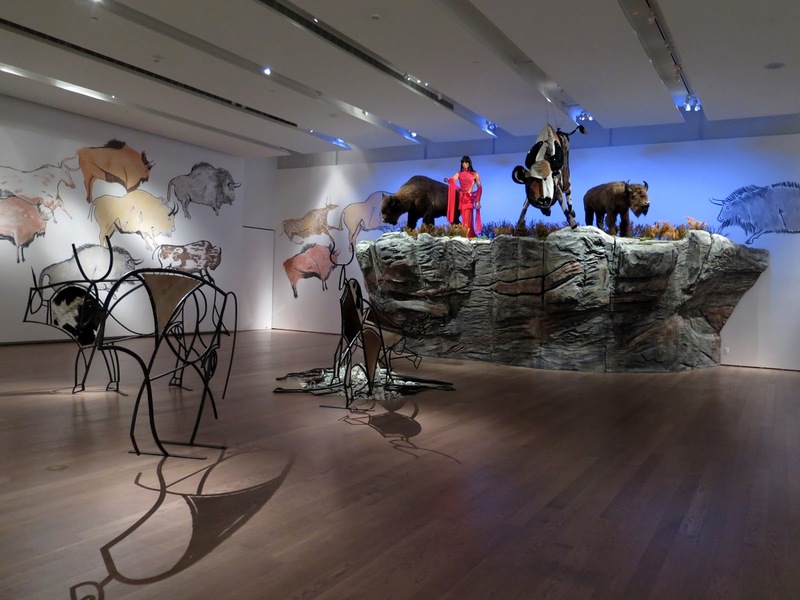 Monkman is a first nations artist of Cree and Irish ancestry whose mediums include film, painting, installation and performance. He uses humour and camp to focus the viewer's attention on the shameful treatment of the Canadian Indian at the hands of colonial settlers. 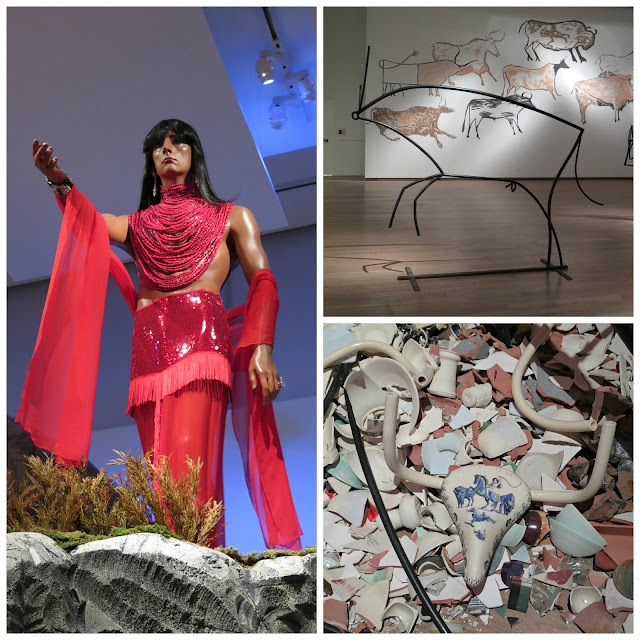 The installation consists of a nine-foot cliff carved from styrofoam, topped with two taxidermied bison, and the figure of Miss Chief Eagle Testickle, Monkman's two-spirited alter-ego. 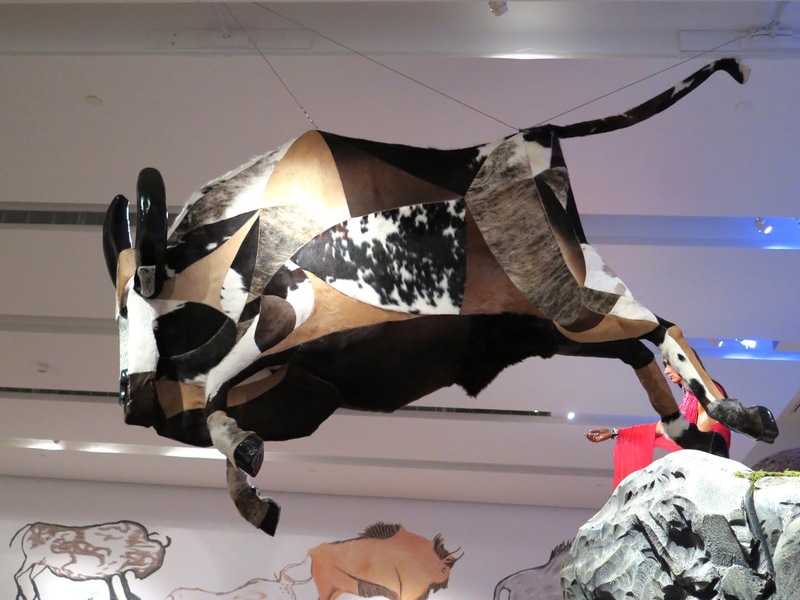 The Great Plains Indians used to hunt buffalo by herding them and driving them off a cliff (known as a "buffalo jump") while hunters waited below to finish them off. At the base of the styrofoam ridge is a pile of broken pottery, representing the pile of buffalo bones often found at the base of a buffalo jump. Two-dimensional abstract figures of buffalo appear to be walking away from the cliff. A buffalo made of pieced-together hides is suspended by wires, appearing to be mid-leap from the cliff. The white settlers drove the bison to near extinction in the 1800's, killing them for their pelts, and leaving the meat to rot. They later collected their bones and used them for fertilizer and for making bone china. Clockwise from left: Miss Chief Eagle Testickle; one of the Picasso-like two-dimensional renditions of a buffalo - the figures become more abstract in shape the further away from the cliff they get. Bottom right: a pile of broken pottery topped by a handpainted clay cattle skull (looking very much like Picasso's famous "Bicycle Seat"). The connection between the bison and bone china is the reason why Monkman chose the Gardiner, which is Canada's national ceramics museum, as the location for his installation. 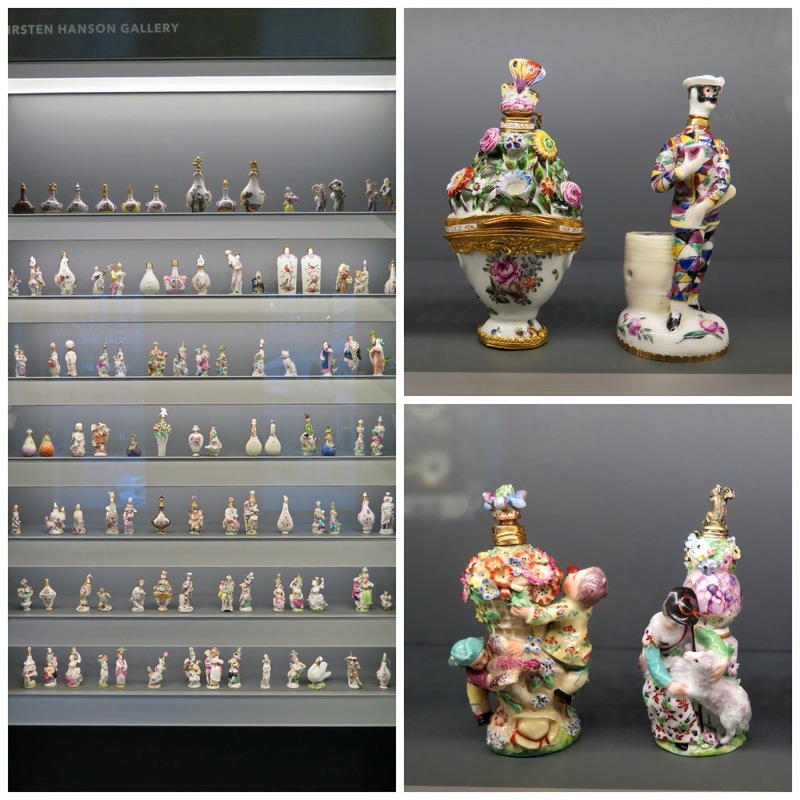 I had never seen the Gardiner Museum's collection of ceramics, so took some time to check out some Japanese and European Porcelain. In art, as in life, I am drawn to four-legged critters. 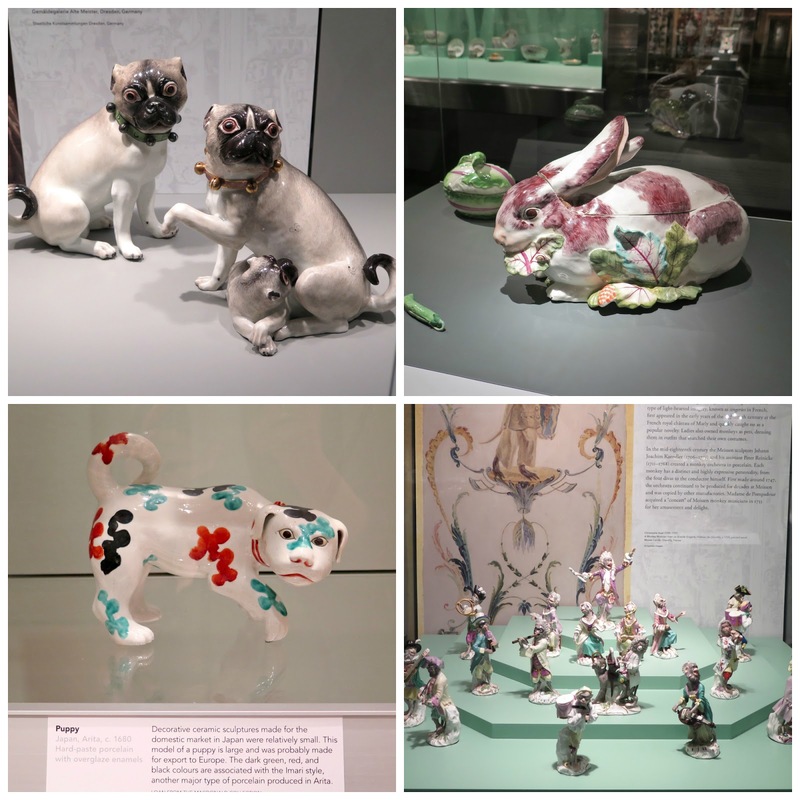 Clockwise from top left: A pair of German Meissen pugs from the early 1940's; English porcelain rabbit tureen from 1755 - 1756; German Meissen Monkey Orchestra from the mid-1700's; Japanese porcelain puppy c. 1680. 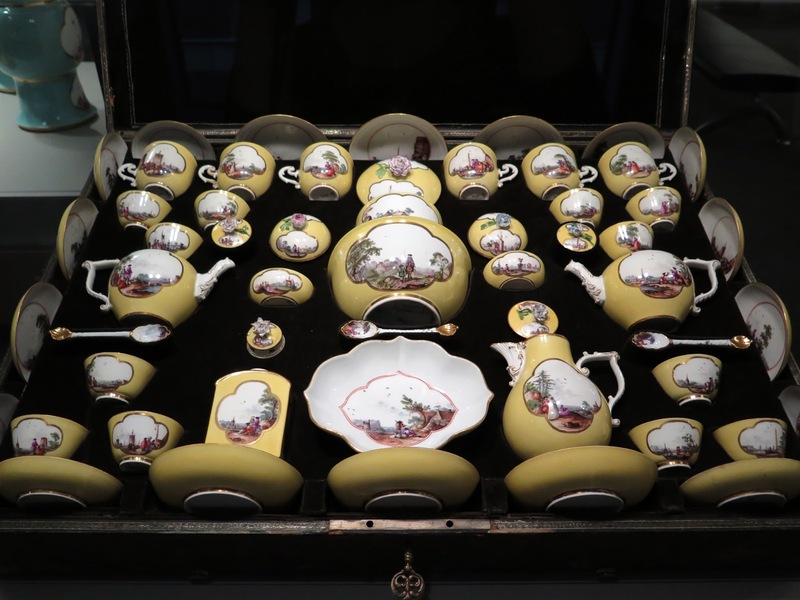 I don't get very excited about dishes, but I did think this German-made tea and chocolate service from the early 1740's was very impressive. The porcelain figures in the cabinet on the left were approximately 3 - 4" high, and remarkably detailed. Coolest hotel ever. I'm glad you got this unexpected birthday treat you could share with Heather. Between a party and a B&W Spencer/Hepburn movie, I'm not sure which I would have chosen, especially with such a great room. Looks like you had fun exploring the neighbourhood too. Now I'm hungry! Now I really want to stay in that hotel! Parkdale is such a fun unique place to visit. That was quite the installation you saw. I think the Gardiner is free right? We might pop across the street and check it out as we are heading out to visit the ROM today. how cool to win a prize for your birthday. Happy Birthday. Happy Birthday! What an amazing treat - it looks like you had a really great mini-vacation. The hotel is beautiful, with or without art. That room looks divine. I'd like to move in, too! wouuu, happy belated birthday!, glad you've enjoyed that magnificent hotel and all those restaurants and activities, it sounds(and looks) fabulous! That IS fabulous! And what a perfect time to get it! Good for you. You clearly used it very well! Happy Birthday Shelley and Heather! It looks like you celebrated in grand style at The Gladstone Hotel. Great company, art and food! What could be better??? And another very entertaining post. Thank you and happy belated birthday.